We were in rush but this shop managed to get our attention when we walked pass it while we were on our way towards Raffles City MRT station. Perhaps, it was the long queue outside the shop got us wondering what’s the fuss. 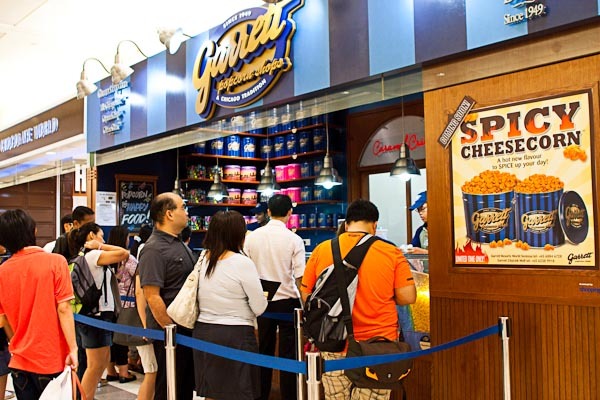 Customers were queuing, overlooking at the counter, waiting for their turn patiently. And secondly, it was the aromatic sweet scent emitted out of the shop that got us all worked up. It was the familiar scent we couldn’t recall what it was but we knew we were familiar with it. 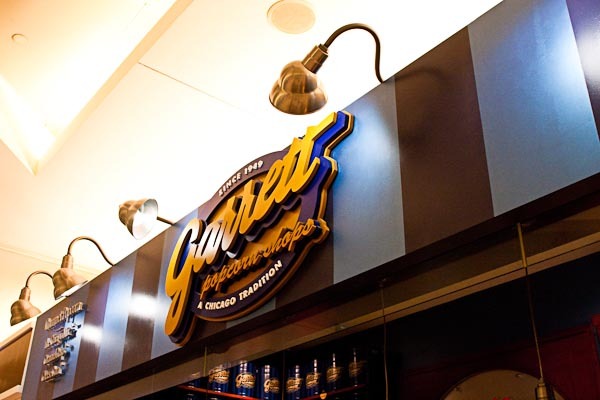 Upon closer inspection, we found out that this particular shop; Garrett Popcorn, sells nothing but popcorns only. Various flavoured popcorns. By then, we were already in queue waiting for our turn to buy / try ’em. As the matter of fact, we were so eager to try it that we’ve totally forgotten about our initial plan. There were various flavours to choose from. 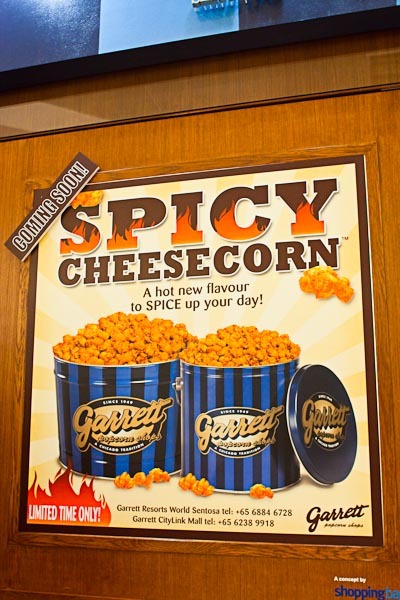 But the most notable ones were the CheeseCorn® and CaramelCrisp®. Instead of going for single flavour, we decided to get the small size of The Chicago Mix. 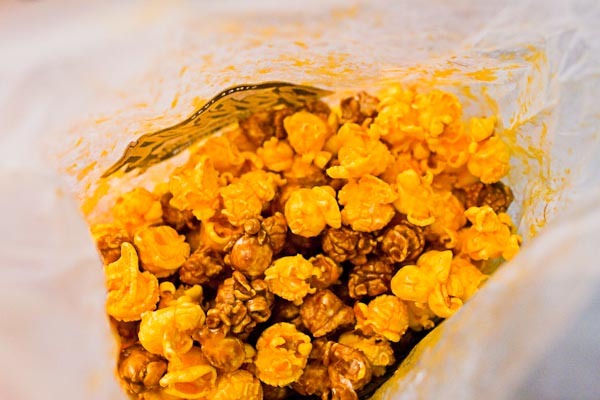 Priced at SGD$8, it came in a small paperbag with a mixture of CheeseCorn® and CaramelCrisp®. Although the size was small, the portion was pretty decent. 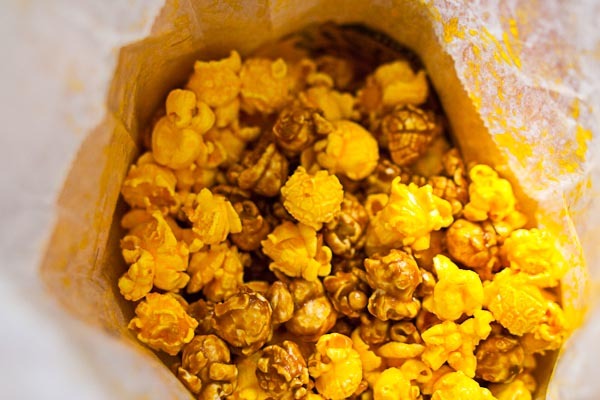 Whether it’s cheese or caramel, each piece of popcorns was large and coated evenly… unlike those you get from cinema. Besides, they were fresh, crisp and light. The sweet bitter taste of caramel plus the salty flavour of the cheese made them really addictive stuff especially when you rotate the flavours. Despite being advised to consume it as soon as possible (as stated on the paperbag), their crisp texture were retained even after we opened it an hour later. There were various sizes for takeaways. The biggest I saw was in a gallon tin. But most of the time, when I was there, customers were taking away a few packets. 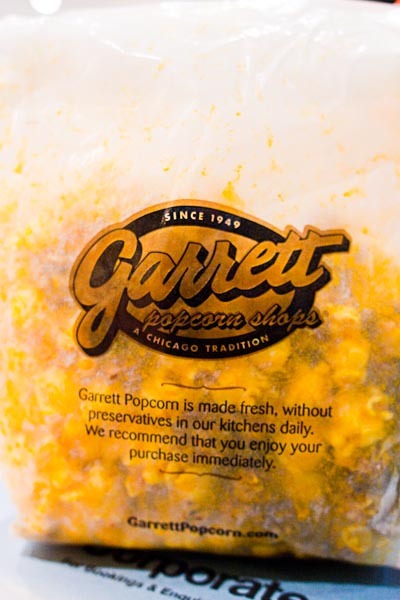 So, do check it out if you are a popcorn lover. The staffs were patient and friendly although there were long queues behind us. They even let us to try out the flavours before buying. And, rest assured that the quality is there as they claimed that their popcorns are made fresh daily… which I can concur judging by the quality of popcorns they served. After all, Oprah named it as one of her favourite things in the year 2002 and 2005.